1. Receive the highest quality science education as determined by educators, free from ideological or political interference. 2. Explore the causes and consequences of climate change. 3. Learn that meaningful solutions to slowing climate change exist. 4. Examine the data and evidence that leads to the established scientific consensus on climate change in a learning environment that encourages inquiry, questioning and understanding. 5. Understand how climate science informs social, political, and personal decision-making. Why do we and our collaborating organizations—Climate Parents, the Alliance for Climate Education, and the Union of Concerned Scientists—feel there is a need for such a declaration of rights for students to learn about climate change? Simply put, because vested interests are overtly and covertly conspiring to deny young people their right to know the basics about climate science. Despite the efforts of many great teachers and schools to teach climate and related energy issues and infuse them into the curriculum, far too often climate change is skipped, skimmed over, or framed as a scientific controversy when, in reality, the controversies surrounding climate change are not scientific, but ideological and political. Bills of rights have a long and noble history dating back to the Magna Carta in 1215. They enjoyed a burst of popularity in the Age of Enlightenment, with the United States Bill of Rights (the first ten amendments to the Constitution) perhaps being the most widely known. Today there are dozens, including bills of rights for such groups as patients, teachers, and consumers, as well as numerous human rights declarations, all designed to articulate the rights of people in the face of the wrongs they are enduring. In this history, there’s precedent for bills of rights for students—as early as 1765, Sir William Blackstone called on parents as part of their duty to their children to provide for their maintenance, protection, and education. And there’s precedent for bills of rights for those seeking scientific knowledge—article 27 of the United Nations Universal Declaration of Human Rights states that everyone has the right to access knowledge and science, and as Americans, we have through deligent efforts spanning the past century acquired legal rights to know about hazards in our food, water, air, and in our communities and workplaces. 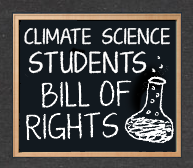 The Climate Science Students Bill of Rights brings both of these precedents together, in recognition of the fact that when it comes to climate change, we—especially young people who will bear the brunt of climate change—need both the conceptual and the practical knowledge to understand and address the causes, impacts, risks, and possible responses to the massive challenge of climate change. Today, due to neglect, avoidance, and deliberately manufactured doubt by special interests, this vital need to recognize the problem of climate change and learn about potential responses to it has not been met. Even where overt opposition to teaching climate change is absent, many teachers who want to teach about climate and energy topics lack the background or high-quality resources to teach it effectively. A survey in 2011 by Yale University found that fewer than one in five teens say they are “very well informed” about climate and energy issues, and more than two-thirds of students indicate they haven't learned a great deal about climate change in school. Too many students graduate from high school and even college without ever learning the basics of climate and energy, and how—through our energy choices—we can minimize climate impacts and prepare for changes that are already occurring. All students should learn about the essentials of climate and energy, but today, because climate change is rarely taught in a complete, integrated way, most of them have had to rely on bits of sometimes-contradictory information for their understanding of climate change. While the scientific consensus on the magnitude and urgency on climate change has emerged since most adults left high school, so most of us have received no formal instruction on climate. Article 6 of the United National Framework Convention on Climate Change, signed twenty years ago by most nations in the world including the United States, called for climate change education and ways to engage the public in developing solutions should be offered. But there have been many—too many—missed opportunities to do so over the past two decades. We can’t afford to let another generation remain ignorant. The good news is there is an emerging panoply of high-quality curricular resources, cutting-edge science standards, and opportunities for teacher professional development that can help revolutionize the teaching of climate and energy topics. The Next Generation Science Standards, which do include current climate science and are meant for all students, are a step in the right direction. But more can and should be done to infuse climate and energy education throughout the curriculum. The bad news is some students are being denied their inherent right to learn the essentials that will allow them to make informed decisions and pursue relevant career paths in the future. Yes, we need to educate ourselves—our colleagues, parents, friends, and classmates—and tell them what’s at stake. We need to push back on misinformation and denial, to speak up at school board and PTA meetings for climate change science and solutions to be an integral part of what the 56 million American students currently in grades K through 12 learn. And all 20 million students currently enrolled in post-secondary education should also master climate knowledge and know-how—both the science behind climate change and the ability to make informed climate and energy decisions in their lives and careers. Support our efforts to empower educators and learners so they can master the essential principles and fundamental concepts of climate and energy. Sign the Climate Science Students Bill of Rights to help us counter doubt and denial, and ensure that climate change is taught—and taught well.